The National Restaurant Association has released the results from a survey they conducted regarding menu changes in 2014. Nearly 1,300 professional chefs and members of the American Culinary Federation were asked what trends will be hot in the industry. These trends included food, beverages, ingredients, preparation methods, and even themes. This comes as no surprise, as our culture has been overrun with the "buy fresh, buy local" campaign. Consumers of all markets are turning away from the chains, and are seeking to support the businesses that keep their communities unique. When combined with the number two trend, locally grown produce, the power of buying local becomes immense for restaurants. At Change, we've seen the "buy fresh, buy local" push become increasingly more prevalent in our home of Des Moines, Iowa. Restaurants like Hoq and Django place the source of their products right on the menu, informing customers of their local support. Not only do local ingredients support your community, but they inspire creativity. They give the kitchen staff the chance to come up with new specials centered around what's currently in season. Smaller farms don't grow crops on an industrial level, and therefore have room to maximize their variety. This gives chefs the chance to truly think outside the box. Going green is not limited to the restaurant community, but that doesn't mean owners shouldn't hop on the bandwagon. Sure, sustainability requires some initial investment. But, the long-run effects are beneficial. Decreases in electric bills, shipping costs, and infrastructural materials all boost the profit margins for restaurants. Owners looking to become more environmentally sustainable have a virtually unlimited amount of ways to do so. A BuzzTime article posted in May of 2013 highlights 11 ways to limit your environmental footprint. All of these options are simple, yet effective ways to let the community know that you care. New trends are always going to pop up in the restaurant industry, but buying local and becoming environmentally friendly are trends that are here to stay. Both can help restaurant owners hold onto current customers, as well as attract some new ones. 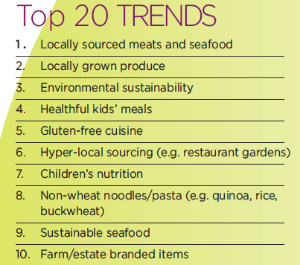 For a complete look at restaurant trends for 2014, take a look at the survey results here.